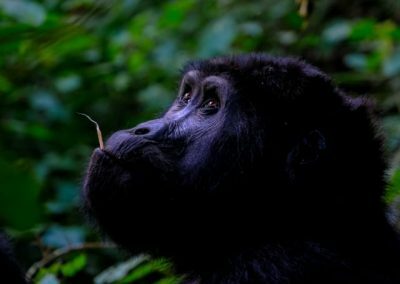 This programme on great apes provides participants with the rare opportunity to contribute toward enhancing the conservation of the endangered western lowland gorillas in Deng-Deng National Park, East region of Cameroon. This programme on great apes provides participants with the rare opportunity to contribute toward enhancing the conservation of the endangered western lowland gorillas in Deng-Deng National Park, East region of Cameroon. Deng-Deng National Park hosts the greatest population (600 individuals) of the most northern western low land gorillas in the wild. Two or more weeks volunteering on great apes conservation will give volunteers an opportunity to work toward long-term conservation of this charismatic species by taking part in gorilla surveys in the rainforest of Cameroon as well as conducting conservation education and awareness raising activities in communities adjacent to this protected area. 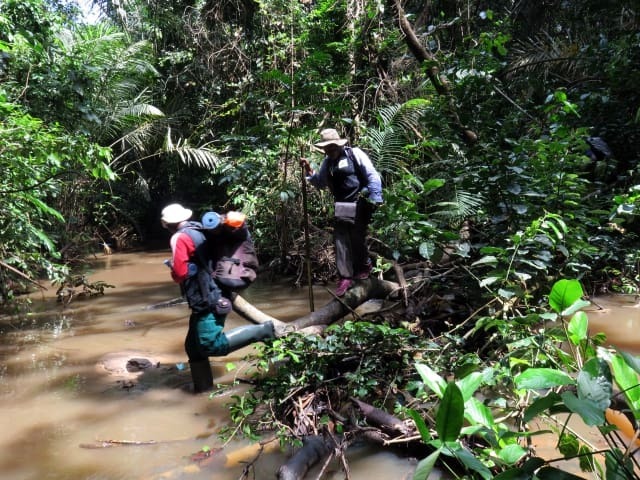 The team will be trekking through and camping in the forest to record information on great apes in the dense equatorial rainforest, this information includes direct and indirect observation of great ape’s presence. A sampling design is established and volunteers receive training prior to the start of the surveys. Each survey period will last two, three, four weeks or longer depending on the interests of the volunteer. 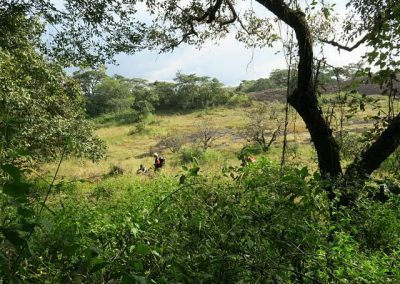 Life during this period is more or less nomadic as volunteers leave the camp tracking great apes for 5 to 7 hours a day depending on the sites surveyed. There are breaks every after three (3) to five (5) days depending on the duration of the trip. Schools and communities will be visited to educate the pupils, student’s local people on conservation of this unique wildlife species. This will raise awareness and change their perception toward Gorilla conservation. Before and after your stay, you can visit interesting places like the Zoo-Botanic Garden in Mvog-Betsi, Yaounde; the Reunification Monument; as well as cultural sites in communities adjacent to the protected area. 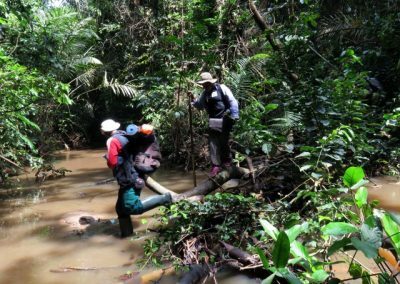 Volunteers gain exposure on conservation realities at the local level; they gain the opportunity to assist in research projects, great apes surveys and attend workshops and meetings with local communities and schools. 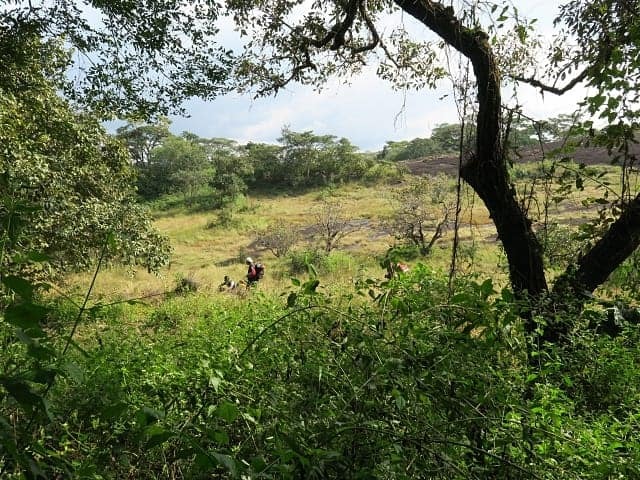 Volunteers also receive training in great apes surveys and biodiversity monitoring, the use of GPS and navigation tools, data collection, and environmental education. Adjacent communities learn from community/school education activities conducted by volunteers – and vice versa you will learn a lot from them about the forest and its inhabitants. 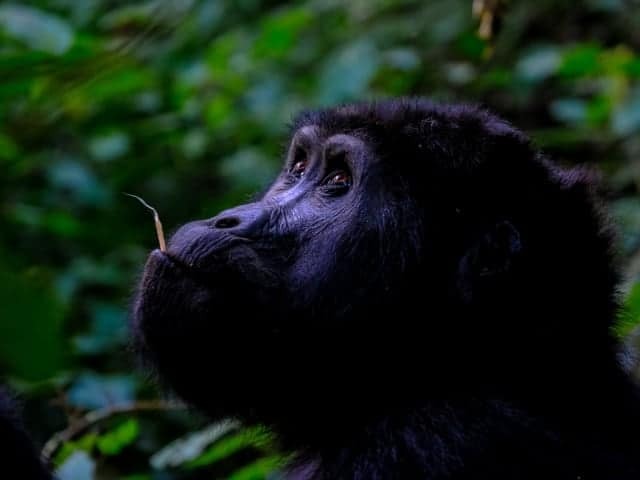 The survival of gorillas, chimpanzees and other primates is constantly threatened by agricultural encroachment (the conversion of forest habitats to farms and plantations), hunting, trapping, and the growing illegal bushmeat market. 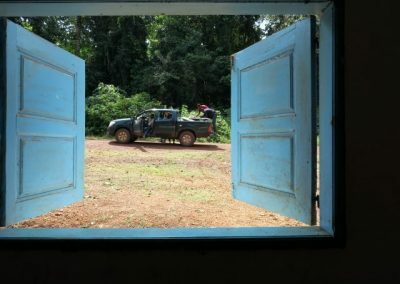 With the help of past volunteers, ACF supported the production of the Management and implementation plan of the Deng-Deng National Park and the project is now working to update the status reports of great apes and other mammals in the area. 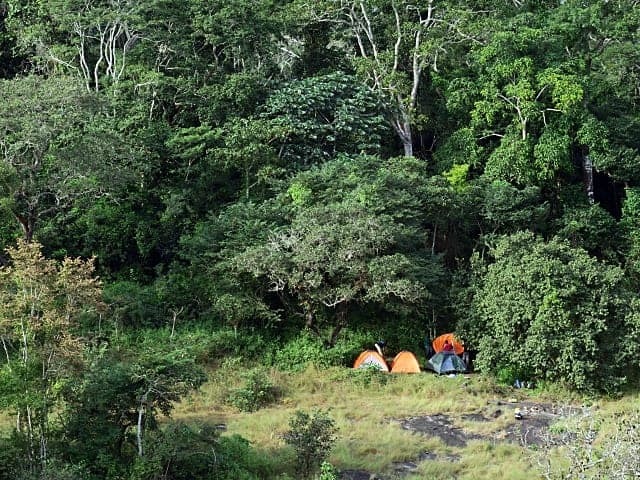 Deng Deng National Park is located in the East Region of Cameroon, in the Lom-et- Djerem division. 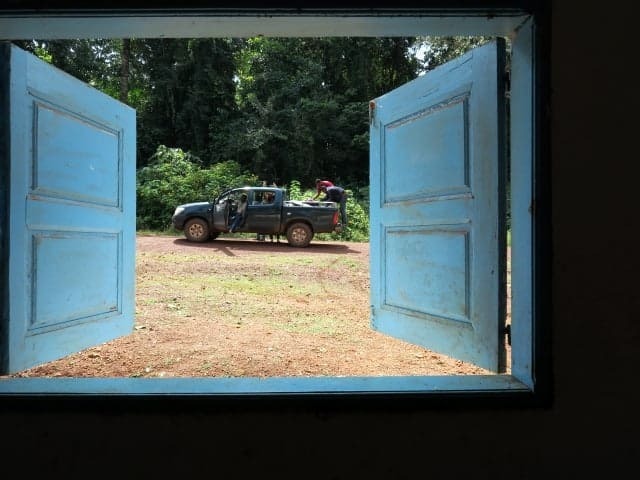 The park covers an area of about 523 km2 and lies between latitude 13° 23 to 13° 34 East and longitude 05° 5 to 05° 25 North, in the North-Eastern part of the lower Guinean forest. It was declared a category II IUCN protected area in 2010 in order to protect great apes, particularly the most northern population of the western lowland gorilla (Gorilla gorilla gorilla) that was reported to be present in this area but threatened by anthropogenic activities within and around the Deng-Deng forest reserve. The park also protects large population of chimpanzees, monkeys and ungulates including buffalo, bay duiker, blue duiker, yellow-backed duiker, red-flanked duiker, bongo and sitatunga. Water dwelling mammals including hippopotamus and swamp otter have also been confirmed in this area. Rainy Season: During the rainy season, there are heavy rains and temperature ranges from 20 to 25oc and may go down to 18oc. Some of your clothes may get wet if not fully protected in water proof nylon and may not dry up as fast as expected. It could be slippery and we advise to bring good rubber boots. The roads are good and accessible from Yaounde to Bertoua. From Bertoua to forest adjacent community there is an unpaved road. The roads are more accessibly in the dry seasons. Please be aware that you may lose some hours because of the poor road network. In communities, there is poor hygiene in some community houses so stick to the advice of your field coordinator. You won’t find water system toilets, or shower baths. There are only pit toilets in the communities. You will have your bath in a stream or in the local hotel using a bucket and drink bottle water. In the forest, you will sleep in tents using (inflatable) mats. There are no toilets so you will use boreholes which you will dig yourself and cover up after usage. In the forest, bathing and all other washing and cleaning is done in the stream (please bring biodegradable soap only). You can treat the stream/spring water with water purifying tablets/drops before consumption. You will eat local traditional dishes depending on the area. We ensure that meals such rice, pasta, beans, irish chip, yams and plantains are available. in the forest, we shall cook our own food and perishable foods will not be best in the field, therefore we usually stick to simple food such as rice, pasta, chips, biscuits, cakes etc. There is no electricity in the communities and at night you will use bush lamps or flash lights, in the communities and at the campsites. The cost to participate in Deng Deng National Park great apes conservation project depends on the duration of your stay. These funds will be used to cover the costs of the volunteers during their stay and and includes a donation to the project.